2. Bats: All manufactured bats are legal. NO ALTERED BATS ARE ALLOWED. 3. Uniform Requirements: Matching jerseys are preferred but not required. 4. Shoes: Athletic shoes must be worn – no hard soled or open toed shoes allowed. 5. Cleats: Metal cleats are not allowed at LSSC. 6. Gloves: Males are NOT allowed to wear a glove at any positions in either division. Females can wear a glove at any position in the CO-ED division. Females are NOT allowed to wear a glove if they are playing in the Male division. a. Players may be signed or released abiding by division eligibility. c. Teams using players who are not listed on the roster are subject to forfeiture of all games in which that person(s) participated. 2. Roster Limits: All men’s & women’s team rosters will be limited to 15 players. 3. Transferring Teams: Players may transfer from one team to another in the same division, ONLY by obtaining their manager’s signature and that of each team’s manager in that division. PLAYERS CANNOT PLAY on two teams in the same division. 4. Age Limit: All players must be eighteen (18) years of age before they play in a game. 5. No new players in post season play! 1. Only coaches and players are allowed in the dugout. Bat boys/girls will not be allowed. 2. There is no smoking or vaping allowed in the playing area (field, dugout, and inside the dome). 3. No outside alcoholic beverages are allowed in LSSC property. Alcoholic beverages purchased from or restaurant/bar or concessions may be consumed in the dome on the concrete area and inside the dugouts. No Alcoholic beverages will be consumed on the field. 4. All trash should be thrown away after each game. 1. The LSSC softball program will be governed by the USSSA rules along with the additions and exceptions listed within this packet. 2. Bench Personnel: Only coaches and players are allowed in the player bench area. Bat boys/girls will not be allowed. 3. Field Dimensions: Bases are 65 feet apart, and the pitching distance is 40 feet. 4. Forfeit Rule: Unless notified by the LSSC that the opposing team has forfeited, each team is required to show up for their game. If neither team has enough players at the field to start the game at game time it will be ruled a double forfeit. 5. Warm-up Procedure: Warm-ups must be conducted outside the ball diamond boundaries, Warm-ups will not be conducted by the bleachers. Infield practice will not be allowed. Teams must be ready to play at assigned game times. Scheduled games can be started early upon agreement by both managers. Each pitcher will receive three warm-up pitches the first inning, and two each following inning. 6. Players to Start/Forfeit: Teams may begin a game with 8 players. There will be an automatic out(s) in the open spot(s) of the batting order in post season play only. The missing player(s) may enter the game upon arrival and in any dead ball situation. Teams without the minimum number of players will forfeit the game. A team may be suspended from further league competition after three (3) forfeited games. 7. Out of play areas: Any ball hit under a fence, thru the netting or past the yellow tape is deemed out of play. The batter will be treated as a ground rule double. If a runners on base will be awarded 2 bases. Example runner on 1st base gets 3rd base, runner on 2nd base gets home, and runner on 3rd base gets home. If a ball goes out of play raise both hands to indicate that it’s out of play. 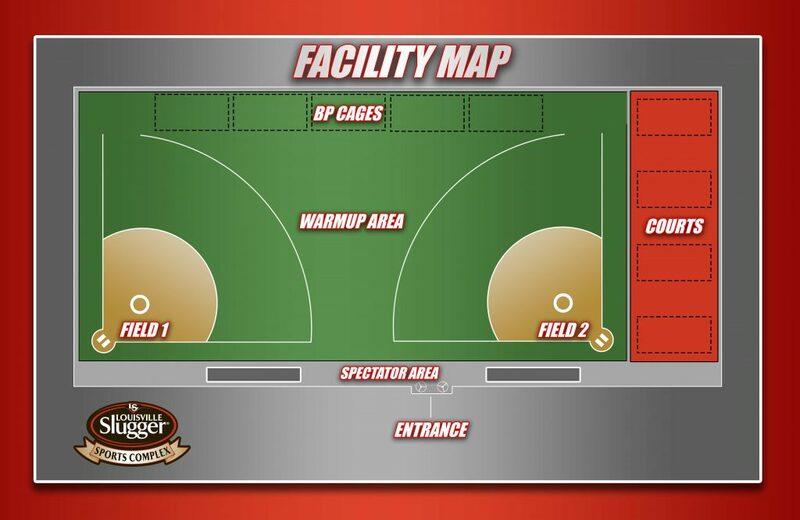 Below are the Out of Play areas. b. Any ball hit under the outfield fences or bounces to the left or right and goes beyond these fences. c. Any ball hit thru the net at the far right corner of Field 2.
a. Game Times: Game Time is Forfeit Time! There will be no grace period allowed. Note scheduled starting times. If a team plays in multiple leagues on the same night they will be given time to change fields. b. Time Limit / Tie Breaker: All games will have a one-hour time limit with no inning starting after 50 minutes If there is a tie after seven innings or the time limit has expired, the international tie-breaker will be used. The player who is scheduled to bat last in that half inning will be placed on second base. c. Innings: 5 innings will be considered a complete game. The home team will always be allowed their final at bat in order for it to be considered complete. (Example: The Home team is leading after six innings, and the game is called in the seventh with the visiting team batting and taking the lead. With the game being called we would revert to what the result was after the last completed inning, which would be the score after six and thus the Home team would win). d. Extra Innings: During extra innings and after time has expired each batter will only see one pitch. A strike or a foul ball will result in an out and a ball will cause a walk. e. Run Rule: If a team is leading by 10 or more runs after five complete innings (home team always gets their final at bats when last inning has been called). a. Batting: Teams have the option of batting 10 players or more throughout the game, as long as the players are on that team’s roster. Prior to game time, ask umpire for a score sheet. Line-ups must be given to the umpire for every game. Teams must continue to bat the same number throughout the game or take an automatic out in the open spot. The lone exception is if a player gets hurt they may be taken from the batting order with no penalty, provided that the team still has 10 players in the lineup. A player not in the original batting order may be added to the batting order later in the game. If a team is batting 10 players and an 11th player arrives in the second inning, he may be added to the bottom of the batting order. The team would then bat 11.
b. Designated Hitter: There are no designated hitters allowed. All players in the field must be listed in the batting order. c. Home Run/One-up Rule: All leagues will use a four (4) home run limit. All over the fence HR’s in excess of the limit will be dead ball outs, except in the following situation. Once both teams have reached the limit, teams are allowed to continue hitting home runs until they are one ahead of the opposing team’s total. d. Hit and Sit. You are not required to touch first base on a home run. e. Third Strike Foul: A batter is out if when a foul ball is hit on the third strike. g. Re-entry Rule: A re-entry batting order rule will apply to all divisions. Any starting player or substitute may re-enter the game once in the same spot of the batting order. h. Free Substitution in the Field: Any player that has not been ejected on your roster may re-enter in the field at any time. This does not affect the batting order. a. A legal delivery shall be delivered with an under hands motion. At no time will a pitcher use a windmill motion. b. The pitcher must present the ball to the batter while standing on the pitching rubber. c. After presenting the ball for one (1) second, the pitcher may take one (1) step in any direction. d. Once a pitcher has taken the step, the ball must be presented again before the ball is delivered. e. NOTE: The non-pivot foot may be placed in any direction except in front of the pivot foot. f. The minimum and maximum pitching arcs from the ground are six (6) feet and (12) feet, respectively. g. The pitcher shall be allowed two (2) fake delivery motions to home plate. On the third motion, the ball must be delivered to home plate. 11. Leadoffs: No leadoffs or stealing is allowed. Runners may leave the base once the ball touches the Strike Plate/Home Plate or is hit by the batter. If a runner leaves early, the ball is a dead ball and the runner is declared out. If this is the 3rd out of the inning the batter will be the first up in the next inning. 12. Strike Mat/Home Plate: A “strike mat” will be used to determine sure strikes, if the softball touches ANY part of the Strike Plate or Home Plate legal pitch (6’ – 12’ arc), it will be considered a strike. Home Plate WILL BE considered a strike as well. The minimum height of a pitch is 6′ from the ground; the maximum is 12′ from the ground in all divisions. . An umpire will determine all balls and strikes. All judgment decisions are final. Any excessive disagreements will result in an ejection from the game and/or league if deemed necessary by LSSC staff. 13. Force Line: The force line is half-way between third and home. If the runner crosses the line he must advance to home. If the runner returns to third after crossing the line the defense must attempt to make a play on the runner for him to be declared out. If the defense does not make a play on the runner, he will be allowed to remain on third. 14. Out Mat: Every play at the plate is a force out. An out mat will be placed three feet in front of home plate. The catcher will use the out mat and the runner will use home plate. If the catcher has control of the ball while touching the out mat before the runner reaches home plate the runner is out. If the catcher touches home plate while in control of the ball no out will be recorded. The catcher may not tag the runner. If the catcher tags the runner, the runner will be ruled safe. 15. Dome Roof: Any Ball hitting the roof will be considered a foul ball. b. The ball is thrown over the back stop and stays behind the backstop. c. The ball is thrown into the dugout. runner to defensive player contact will be closely watched by the ump. Any excessive contact or collision will result in an “out” and/or ejection. This includes contact with the catcher. Sliding is allowed. Any sliding into a base to break up a double play, or any intentional (in the eyes of the monitor) interference with the defensive player, the runner and the batter will be called out. 18. Home Plate: At home plate all outs will be force outs. The catcher will use the out plate in front of home plate and the runner will use home plate. If the catcher attempts to tag the runner he shall be declared safe. 19. Umpire: One umpire per game. 20. Player Ejection: If a player is ejected and no substitute is available an out will be given each time that player should have batted. If the number of players falls below 8, the game is forfeited. 21. Rules of Conduct: EACH MANAGER WILL BE HELD DIRECTLY ACCOUNTABLE for the conduct of his team and is responsible to see that all program objectives and rules are observed. The manager must maintain complete control of themselves and their team members at all times. Officials and their decisions will be respected and not interfered with at any time. Any unsportsmanlike conduct, poor attitude, disrespect, vulgarity and profanity will not be tolerated. 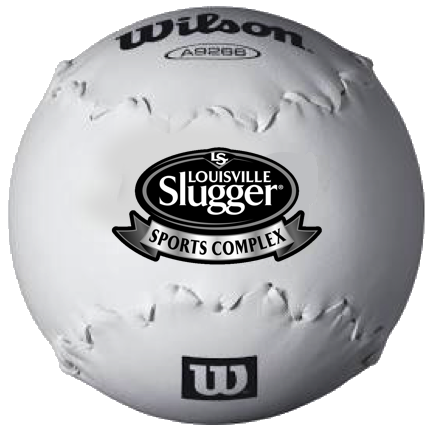 All players are subject to the Louisville Slugger Sports Complex Behavior Code, which is attached. A player may not serve his suspension during a game his team forfeits. Players may not be at the fields during games for which they are suspended. Further action could be taken depending on the seriousness of the offense. This includes improper conduct before, during, and after a game or behavior as a spectator. A game will be forfeited if team fails to respect the official’s authority or decisions after one warning has been given that such action will be taken. 1. Batting Order: The batting order must alternate M/W or W/M. Teams may bat ten or more players. If teams have fewer than ten players they may include one more man than woman in their lineup. Outs will still be taken in the open spots. 2. Defense: No more than five men may play on defense at a time. At least 3 females will play in the infield each inning. 3. Walk Rule: If a man walks with fewer than two outs, he automatically advances to second base and the woman must bat. With two outs, if a man walks, he advances only to first base. The woman then has the option of taking a walk or batting.